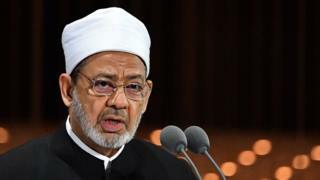 The grand imam of Egypt's top Islamic institution, al-Azhar, has said polygamy can be an "injustice for women and children". Sheikh Ahmed al-Tayeb, Sunni Islam's highest authority, said the way it is often practised comes from "a lack of understanding of the Koran". He made the comment on his weekly television programme and on Twitter. After sparking debate, al-Azhar clarified that the cleric was not calling for a ban on polygamy. He reiterated that monogamy was the rule and polygamy the exception. "Those who say that marriage must be polygamous are all wrong," he said. The Koran, he added, states that for a Muslim man to have multiple wives, he "must obey conditions of fairness - and if there is not fairness it is forbidden to have multiple wives". Sheikh al-Tayeb also advocated a broader revamp of the way women's issues are addressed. "Women represent half of society. If we don't care for them it's like walking on one foot only," he said on Twitter. Egypt's National Council for Women responded positively to his comments. "The Muslim religion honours women- it brought justice and numerous rights which didn't exist before," said Maya Morsi, the council's president.